In Rouen Cathedral - Monet tapestry we see the famous cathedrals from Monet's work from 1890. The series of cathedral paintings by Claude Monet, the French impressionist artist, shows the beautiful gothic cathedral in various light of the day and through the year. Here we see the cathedral in "Harmony of Blue and Gold" where the light of the darkening blue sky blends with the golds of the church to create a biphasic play of light to balance the scene. The play of light is further accentuated, in his ingenious way, with the use of impressionism to create texture in all aspects of the subject as if the light itself is dancing on the object's surface. He created over 30 renditions, displayed in his Paris gallery, and seen by Pissaro and Cezanne. The Rouen is a cathedral in Normandy, France and shows the gorgeous and distinctive Roman Catholic Gothic architecture. 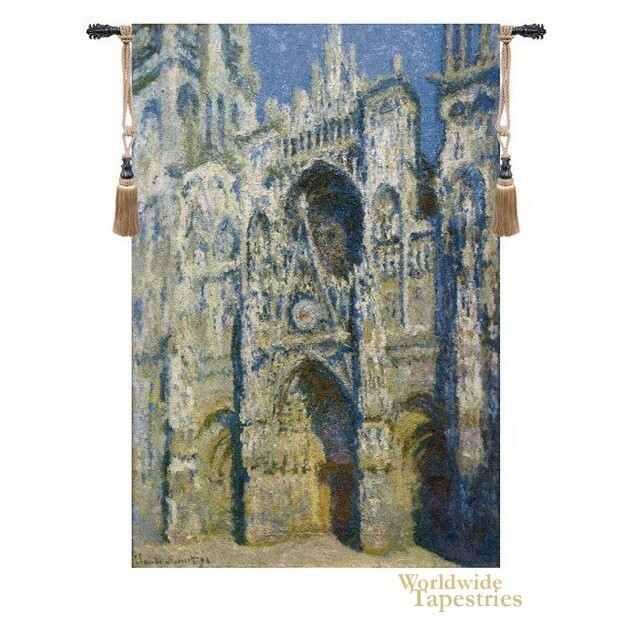 Rouen Cathedral - Monet tapestry is backed with a lining and a tunnel for easy hanging. Note: tapestry rods and tassels, where pictured, are not included in the price. Dimensions: W 48" x H 71"